First published in 1903, Selections from Homer's Iliadhas become a classic Greek textbook. 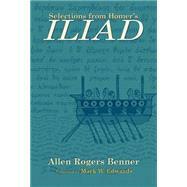 Allen Rogers Benner presents selections from twelve books of the Iliadboth in Greek and English. Short summaries between books bridge the narrative and aid the student in gaining a comprehensive view of the Iliadas a work of literature and art. Invaluable resources include an extensive section of notes on the text, a short Homeric grammar, and a vocabulary and Greek index. In a new foreword, Mark W. Edwards argues for the utility of Benner's text while offering a useful summary of current scholarship on the historical sources of the epic, Greek oral tradition, and Homeric style and diction. Benner's Iliadwill join Barbour's Herodotusand Garrison's Catullusas indispensable volumes in classical culture and literature available from the University of Oklahoma Press.